March 14th for most people is just another day. However for those with a penchant for physics honoring Albert Einstein's birthday and geometric foodie ambitions the celebration hosted by Pi Kitchen + Bar Denver Downtown and Yelp proved to be a resounding success. The servers, dressed in their best adorned with hilarious eyewear served several hundred patrons anxious for the delicious appetizers such as veggie curry, chicken with coconut rice and shrimp with noodles. Refreshing arrays of libations hosted by Patron and including Pi’s signature cocktails with Pop Rocks flowed liberally and were enjoyed by all. The climax of the evening involved a pie eating contest and a scrumptious cake decorated with the bust of Albert Einstein. Everyone gained friends (and perhaps a little weight) and discovered a new restaurant and bar in downtown Denver. 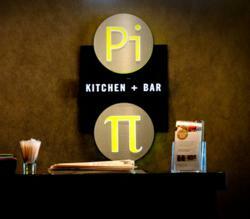 Pi Kitchen + Bar is located conveniently in the Hilton Garden Inn hotel across from the Colorado Convention Center on the corner of 14th and Welton St. in downtown Denver, Colorado. Pi Kitchen + Bar offers a “Global Fusion” style of food preparation combining traditional favorites with Asian, American and Southwestern influences. Come enjoy downtown Denver dining at its finest (restaurant guests always enjoy free Valet parking) and we look forward to seeing you here.